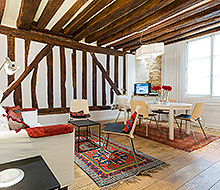 This one bedroom unit is located on the third floor of a carefully preserved building that was a convent in the 18th century and has the well-groomed and secluded courtyard to show for it. The original building dates back to the 17th century and was the inspiration for some of the stories in Victor Hugo’s Les Miserables. The split-level apartment features ultra modern style combined with antique touches. The main salon offers Ligne Roset sofa and chairs, built-in bookshelves, and dinette, and also overlooks the garden. A curved staircase and interior windows add to the spaciousness of the room. The fully equipped kitchen also overlooks the garden. With a clean and contemporary charm, this kitchen offers modern appliances and bar-style seating. 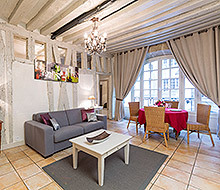 On the upper level, the bedroom overlooks a small street and the Couvent des Spiritains, which has a lovely chapel. The antique Louis XV secretary sets off the contemporary look of this comfortable bedroom. The room features a whole wall of closet space, a large flat screen television, and a queen size bed. On the same level, you’ll find the sleek and modern bathroom with shower, washbasin, and WC. Perfectly situated near food markets and pedestrian shopping streets, the flat faces a beautiful courtyard and is very quiet. There is an interesting mix of people who actually live in the neighborhood, mostly students and families from different backgrounds. The neighborhood is one of the most authentic in central Paris. The flat itself is nicely laid out and fairly well equipped. I would suggest better kitchen knives but it was very nicely stocked with basic necessities. Wonderful experience. Interesting neighborhood, close to the Metro, very clean and well-arranged living space. We will certainly recommend to friends. The apartment was exactly as promised. Great location, comfortable accommodations with two or three obvious, non-essential exceptions: 1. kitchen is barely minimal; 2. bathroom space is very limited for two people; 3. bedroom can be noisy at night, thanks to the nearby restaurants and bars (insulated windows would probably help). 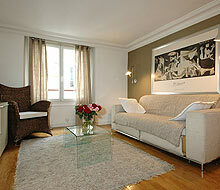 A real positive was the smooth and helpful operation of Paris for Rent. We hope to use you again. Thanks.